It seems like just yesterday we were ringing in the new year and spouting our resolutions for 2015, doesn't it? Well, maybe that's bit of an exaggeration, but the year is flying by all the same. We spiraled through the whirlwind of school delays and snow days and, when we landed, all of a sudden it was Easter and spring was here! That's how it has felt for me at least. Back in January, I made a list or resolutions for this year. Too often, these resolutions are very general and they are quickly tossed aside. This time, I tried to make mine more specific and I vowed to check in regularly. In my mind, I planned to review them quarterly and see how I was doing. 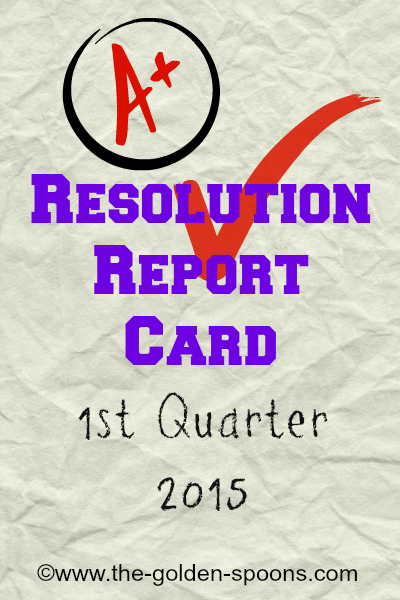 The first quarter of the year is up and it's time for me to take a look at how it's going. I thought it would be fun to do this review just like the report cards my kids get from school, so I've given myself a grade for each resolution and made a few comments about my progress. Read 6 novels in 2015 (one every 2 months) - A - I am happy to report that I'm doing well on this one. I've read 4 books - Landline, Gone Girl, The Light Between Oceans, and Wonder. The first three were on my list and the last was part of a Women's Bible Study group. The good thing is that I've made great progress on this goal. The bad news is that I read the first three in January-early March and I haven't picked up a book in the last 6 weeks (other than the "assigned" one). I have The Book Thief, Me Before You, and The Lovely Bones sitting on a shelf. Which one should I dive into next? Get content with my body - C - This one is so hard for me! I'm working on it, though. Some days are better than others. I have a doctor's appointment this week that will, hopefully, give me some answers and help me figure out next steps. Go to the Gym at least twice a week - B- I have done this most weeks. The weeks I haven't were due to snow days, sickness, or vacation. There are some times when I could have made a bit more effort to get there, but I didn't. Implement and stick to a chore system - B- I haven't really implemented a specific system, but I am getting the kids to help more around the house. A lot of the credit for this goes to my husband who is much better about enforcing the chores and the consequences for not doing them. (I tend to just avoid the fight and try to do it all myself.) Mostly, it's been a loose system of me giving the kids a list on Saturday mornings and them doing the tasks before we go anywhere. Ha! My 5th one was just to keep the first 4! :-) I forgot I had put that on the list! Taking averages, I'll give myself a B. Post consistently 2-3 times a week - A- With Tuesday Ten and One Word, I have basically "obligated" myself to post twice a week. A few times, I've even made it three times. Truthfully, though, I am currently re-evaluting this as it has turned out to be a stressful commitment sometimes. Take 4 blogging breaks - A - Last week, my kids were on Spring Break. David and I left the girls with my parents and went to London! You know what? I didn't even take my computer! I didn't write any posts, didn't read any posts, and was rarely on social media. It was such a relief and so incredibly nice. (And, one of the reasons I am reevaluating #6). I plan to take other breaks in June, October, and December. Post a Sunday Supper post on the second Sunday of each month - F - I did a round up type of post rather than a recipe in January. I did a recipe in February. March and April - nothing. I just haven't tried any new recipes that my family liked and that I thought were share-worthy. Have at least 6 posts featured on other sites - A - I have had one HUGE success with this one by finally having a piece (and more subsequent pieces) featured on The Huffington Post! I also had one piece on What the Flicka?. I've submitted a few others that were rejected, but I'll keep submitting. Be featured in 2 more anthologies - A - I've had one piece accepted to a recipe anthology that will be coming out sometime this year, so I'm halfway there! My word of the year was CONFIDENCE. With regard to that one, I'll give myself a C. I was doing pretty well at first, but I've slipped a bit lately - mainly with #2 on my resolutions. I'm doing pretty well, though, with making confident decisions. Always room for improvement, however! Did you make any resolutions for 2015? If so, how are you doing on your goals? This post was part of the One Word Blog Linkup hosted by, Janine of Confessions of a Mommyholic, Marica of Blogitudes, and me! This week, the word prompt choices were Fight and Yesterday. If you would like to join the linkup you can find more information HERE, sign up for weekly emails HERE, and/or join our Facebook group HERE. Every Friday, two prompts are emailed. Choose one and write a post using that word as inspiration. Linkup up any time between 6:00am EST on Wednesday-9:00pm EST on Thursdays on any of the host sites. OOH I need to do this - go back to my goals and re-evaluate where I'm at! Thanks for the reminder Lisa! I'm so inspired, Lisa. You seem to have achieved so much. Congratulations on the HuffPo post. It's on my list of things-to-do this year. I'm going to re-evaluate my resolutions too. I think you did a nice job of grading yourself! I've been feeling completely overwhelmed this month and so have a lot of others I've spoken with. I'm hoping things settle down again by May. I've never done it before, but it was fun and a good reminder of my goals! The Lovely Bones was always my favorite book. I haven't read it in ten years so I'd be curious to see what it would be like now for me. I've changed some! I've done ok with resolutions. Some I've made along the way, like cutting way back on refined sugars and also, drinking more water! Read Me Before You next! I think you are doing a great job with your resolutions. I didn't make any, so I am doing fabulously! I'm getting an A and an F, in all of the ways. I LOVE LOVE The Book Thief and Lovely Bones SO MUCH. Both. You have to, both. They are incredible. I'm so glad you were able to take a blogging break and focus on Paris and I can't wait to see the photos! Ha! The nonexistent resolutions are the best kind! The blogging break was great. However, I thought it would reinvigorate me and it hasn't. In fact, ti's kind of had the opposite effect - I didn't miss it that week so I find myself thinking that maybe I wouldn't miss it if it were gone for longer (forever? ), but I would miss all my friends. What a great list! I don't think I tell Ken often enough how much I appreciate him. And I get frustrated when the kids ask why he's still at work some evenings. I tell them that he works hard for us though, and I hope they appreciate that as much as I do! Good for you! I see a lot of successes here! I have been trying a lot of recipes as well, but none that felt share-worthy. So a quick question- how do you find anthologies you want to be a part of? I have been hearing about this lately and am intrigued by the whole idea! He really does sound like a good guy, Lisa! I linked up a post a wrote a little over a year ago (slightly updated). Thats super cool Lisa! Congrats on 17 years :) Here's to many many more! You are modeling it and I'm sure they will see that. It took me a while to learn to appreciate it myself! I think he's a pretty goo guy, too! 😉 Loved the post you linked! Various sources. I was asked to be in The Mother Of All Meltdowns and the editor of that one is doing some more. If you are not already, join the Beyond your Bloggers FB group. She posts opportunities for submitting to anthologies (as well as other sites).